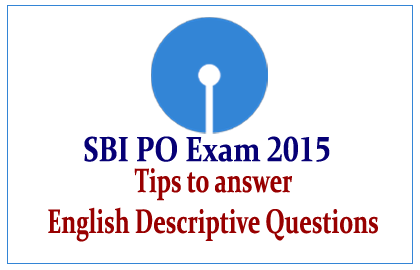 List of Important Tips to prepare for the English Descriptive Questions that will take part in the SBI PO Exam was given here. Candidates those who are preparing for this exam can use this. This is part has been added to test you English Language skills. This consist of three questions, one questions from each section given below. You will be provided with 1 hour to complete all the questions and total marks will be 50. Ø Read the essay question carefully and highlight the key words. Ø Finish any necessary reading or research as background to the essay and write notes in your own words. Ø Brainstorm ideas in response to the question and jot down any relevant points. Ø Then develop a thesis (idea/ Argument) that encapsulates the responses to the question. Ø Write a plan for the response and order ideas in a logical sequence. Ø Write the main body of the essay and ensure each point is given a new paragraph. Ø Write the essay conclusion and summarise the main ideas. Ø Edit the draft (i.e.) check for spelling, punctuation and grammar. Ø Finally, write the final copy and present a clean, neat copy. Ø Learn with shortening in your words, text of written work useful writing tips, essential thoughts, ideas or fact on how to write a précis writing format withpreciswritingexamples.wordpress.com. Ø It is generally accepted that a precis should be a third of the passage given. If the original passage has 300 words, the précis should not be more than 110 words in length. Ø A precis should be in the language of the precis-writer. The original passage is not to be reduced in length by just removing unimportant or unnecessary sentences and by reproducing the rest as the precis. It should be a brief gist or summary of the passage expressed in the writer’s own words. Ø A precis should be full i.e. it should contain all the essential thoughts, ideas or fact in the original passage. It should not contain repetitions or observations that are not relevant to the main theme of the original. Ø A precis is always written in Reported Speech. The passage given may be a speech made by a person in Direct Speech, but the precis is to be in Reported Speech and in the Third Person and in the Past tense. Ø Reading comprehension is the ability to read text, process it and understand its meaning. Ø An individual’s ability to comprehend text is influenced by their traits and skills, one of which is the ability to make inferences. Ø If word recognition is difficult, students use too much of their processing capacity to read individual words, which interferes with their ability to comprehend what is read. There are a number of approaches to improve reading comprehension, including improving one’s vocabulary and reading strategies. Ø You have to remembering word meanings, following the structure of a passage, finding answers to questions answered explicitly or in paraphrase, recognising a writers purpose, attitude, tone and mood, and drawing inferences from the context. More Materials about English Descriptive Questions will be updated soon, Keep following.